Today I went to Horse Creek Farms to pick strawberries. I turned at the hand-painted signs, one corner and then another and another, off the paved road and onto a gravel lane, and then along a bumpy track beside a ryegrass field. 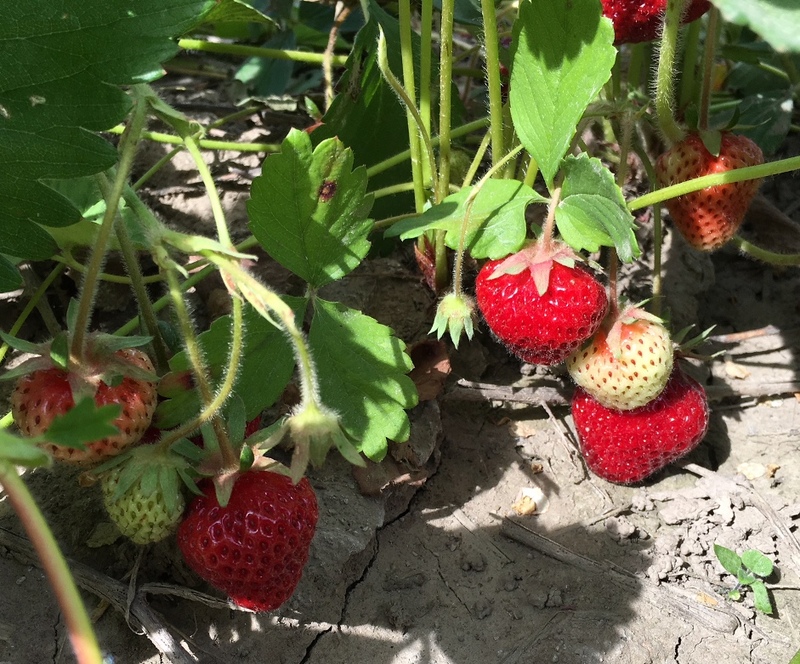 It was only the second day of the season, and the berries were large, plentiful, and perfectly ripe. It took only a short time to pick two ice cream buckets full. I kept running into people I knew. Gina and her children were at the edge of the patch when I arrived. I picked alongside Shannon's children toward the center of the patch, and 12-year-old Benson told me he'd just read in one of my books about picking strawberries in Minnesota. Shyla was picking into the cutest little bucket. I ran into even more friends and their children when I was checking out, and I showed Teresa a shot of the youth group and her daughters on their trip to Canada, painting at Beaver Lake Camp. Sherry checks out Elissa and Carita. "Are you all by yourself?" at least two people asked me. "Yes. I'm at that stage of life now," I said. 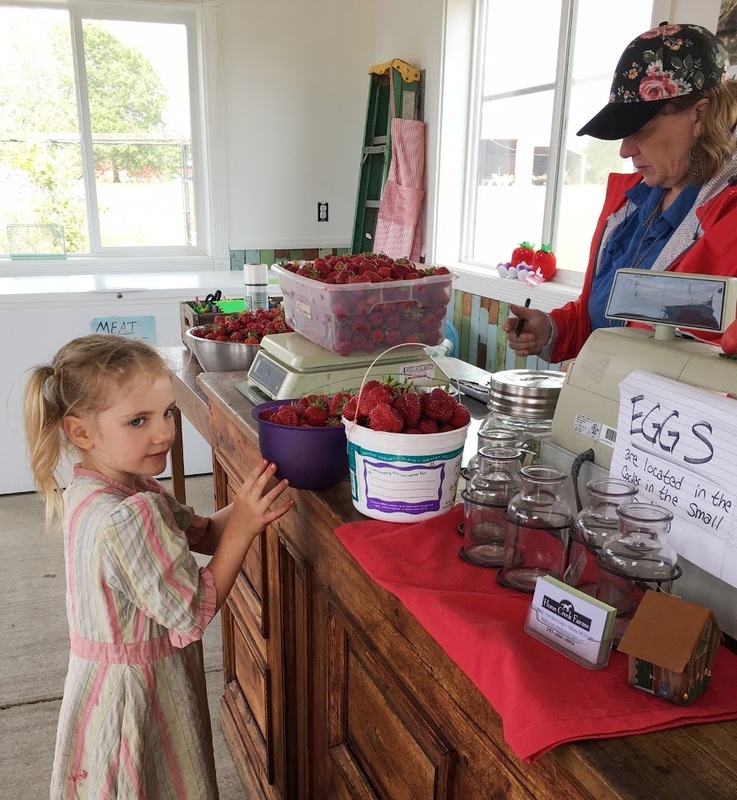 And I looked around at all the moms with children out in the patch and wondered if they had any inkling how special this day was, this moment, or this task. 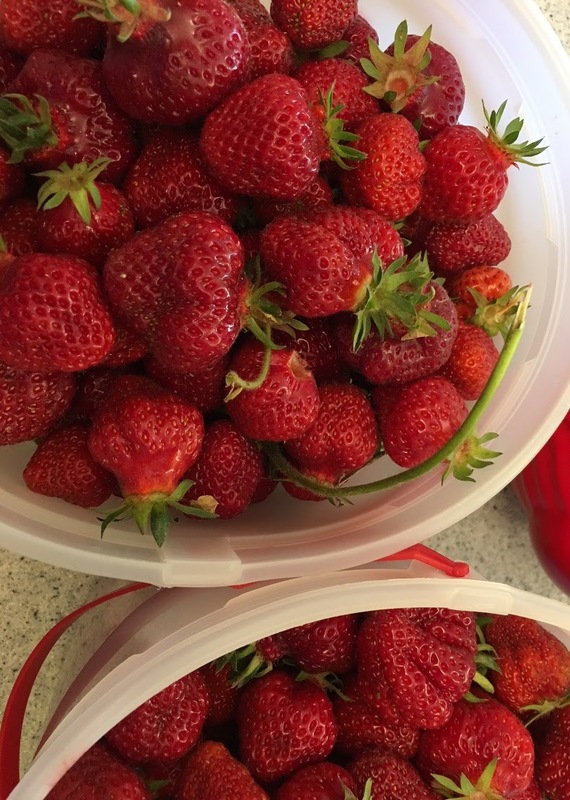 Not so terribly long ago, I used to corral everyone who wasn't busy at the warehouse, prod them into the van, and go to Harry's Berries or Horse Creek Farms to pick 50 pounds or more of berries. Invariably, one child was lazy, an older sibling was bossy, somebody had to pee, the toddler was dirty, someone spilled a bucket, and I tried to drum up energy and enthusiasm for us all. Also invariably, some older person in the patch would say sweet and sentimental things to us, like how wonderful a family we had, and how lovely it was that we were all out picking like this--comments that seemed vastly more flattering than the current behavior and attitudes warranted. I always thought it was kind of odd. 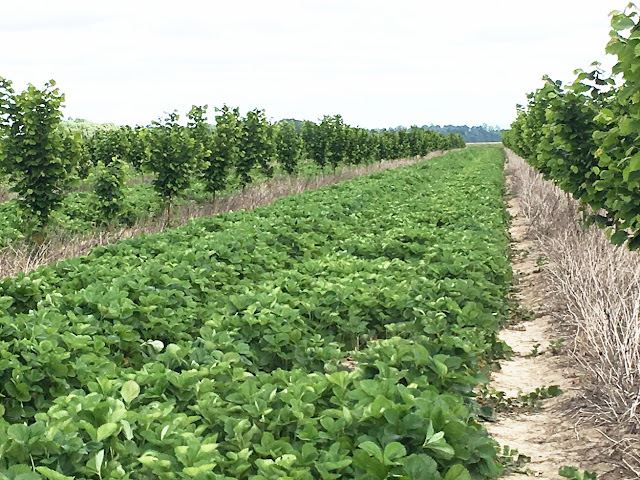 But today I looked around at the acres of green leaves in the sunshine, the bright miraculous berries hidden below, the beautiful families out gathering together--competing, talking across the rows, helping the toddlers--and I wanted to say, "You guys! This is just the most amazing thing ever! You have no idea!" Corwin had earbuds in, which helped him pick faster of course. To the Berry Patch Moms: You are doing it right. This is how it's supposed to be, right down to the squished berries on your children's knees and the slow 10-year-old and your own impatience to get the job done. 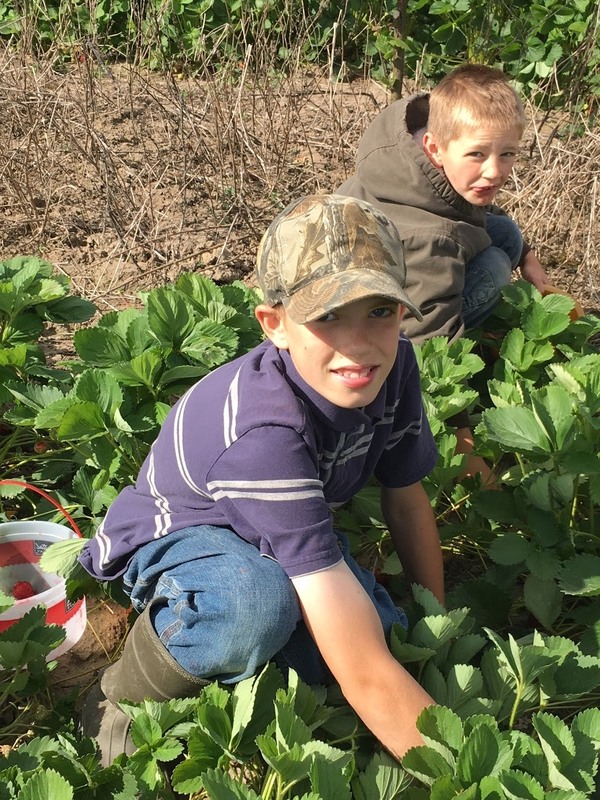 Picking berries together in the sunshine will give your children a solid core and a valuable advantage that will never leave them. After the last container of berries is in the freezer, please sit down with a dish of ice cream and fresh sliced berries. Take a bite, close your eyes, taste and believe. It is a miracle, and you are making it happen. 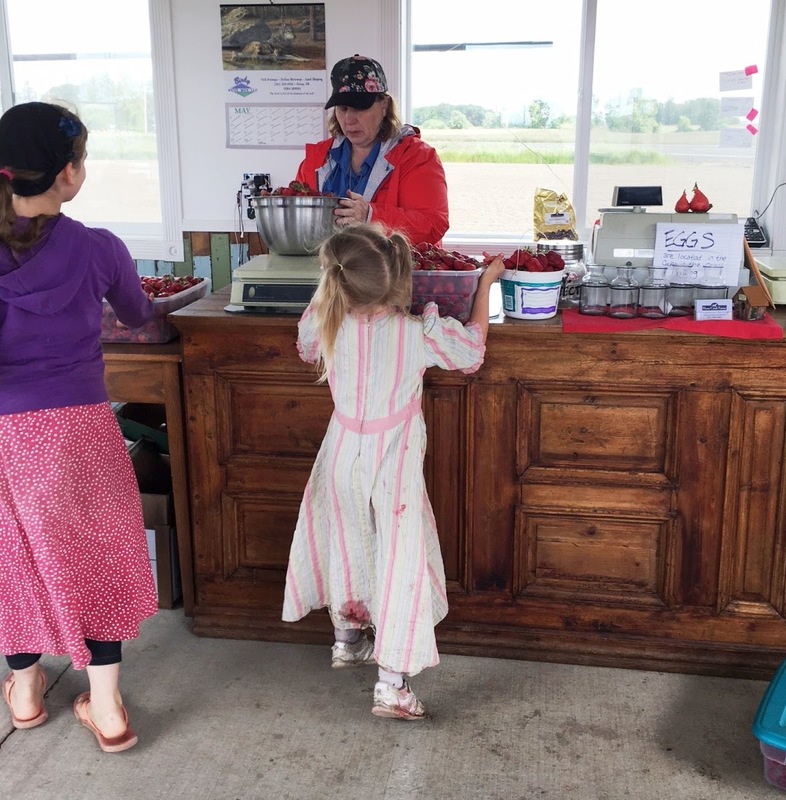 You simply can't go wrong with taking your children to Horse Creek Farms to pick strawberries. 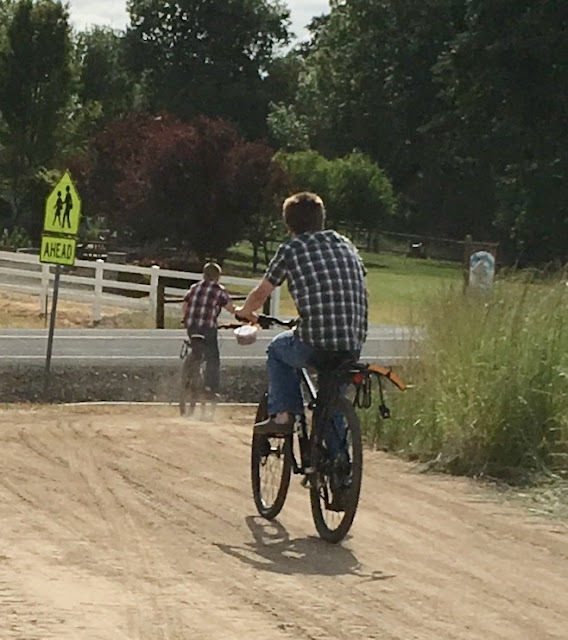 I was told that these young men biked all the way from Halsey to pick for their mom. "I'm thinking about what strawberries cost in Manhattan and crying a little inside. On the other hand, there are tons of people from here who've never been in an Oregon strawberry patch eating warm berries and going home with buckets-full to eat and freeze. So I'm very blessed :)"
I really hate dealing with huge, soul-less entities such as government agencies, airlines, medical establishments, the great Amazon, and cell phone companies. I hate hunting for the number, making the call, and picking through endless options that never lead you to a real person, only to more recorded options. And all the while I have this Big Problem that I need a Solution for, and they are the only ones who can provide it. Feeling like a tiny and desperate bit of voiceless nothingness dealing with a large and impersonal machine, I have shed tears of frustration over replacing lost drivers' licenses, applying for passports, selling books on Amazon, and changing tickets. Always, I felt like there was no actual person anywhere in that vast corporate entity that would speak to me, person to person. Or, if a real person finally answered, it was always someone from India with such a pronounced accent that I couldn't understand half of what they said. Recently, to the great sadness of many of us, the newspaper that carries my column, the Eugene Register-Guard, was bought out by a large corporation called GateHouse Media. They own a gazillion newspapers and are based somewhere far away like New York. The first sign of change for me came in the form of two identical letters containing two identical forms telling me that I must fill out these forms before I can be paid. They were the most obtuse forms you ever saw, with many blanks to fill in, conflicting directions and stern warnings. I did my best but was utterly lost. However, writing letters has always been my way of dealing with life. I sat down and wrote out my many feelings and frustrations in an email, knowing that if it ever reached its destination, it would be scanned by robots and I would never receive an adequate answer. This is adding insult to injury. Not only did you buy out our beloved Register-Guard, but now I have forms to fill out before I can be paid for my column. Forms that make no sense, forms that were surely invented at Guantanamo as a supplement to waterboarding. I suppose I am a vendor, since I received these ghastly forms in the mail. What is my vendor #? How is it obtained? And "requested by"??? What does that even mean? I think you guys are requesting that I do this, but I have a feeling that's not what goes on that line. And why am I receiving a paper form if I am supposed to send it to an email address? And what on earth is with that 10-digit reference number, in bold type no less? I have no idea what this is all about. Seriously, for a media company, your communication skills do not portend well for the Register-Guard's future. I felt better then. And of course they didn't email back. Today, a bit desperate to get payment for my May column, I found a number and called them. Of course no one answered, and I left a message. But not long after that my phone rang! It was a real person, named Sandy! With an American accent! She told me, with just a bit of amusement in her voice, that she personally got my email the other day and she'd like to be of help to me. Then she explained everything, in detail and with great kindness. I am feeling just a bit silly but still happy to be wrong about that particular corporation. "You have to have that 10-digit number on your invoice, because we have thousands of people we pay every day, and if there are duplicate names your payment could go to someone else!. . . Although I guess there's not much chance there's another Dorcas Smucker in our system." I stood in the morning chill and sold my mother’s fabric. She is well-settled in heaven, I am sure, yet her presence felt near and real as I arranged her collection of vintage linen tea-towel calendars and laid out the calicoes from the 1990s, all country blues and mauves in tiny florals. I also arranged my own fabric collection on the plastic tables in my friend Patti’s driveway. Mom left baskets and tubs and boxes of fabric when she passed away, and dresser drawers stuffed too full to open. I dug through her stash for my favorite pieces and added them to my own vast collection, which accumulated in the attic and sewing room and, eventually, in places where fabric didn’t belong, such as the chicken shed and laundry room. Like Mom, I had purchased each piece with specific ideas of what it might become. Also like her, I magnetically attracted other people’s outdated castoffs, in which we saw scrap quilts and stuffed toys and ruffled pillows. Finally, though, I admitted I had so much fabric it was actually stifling my creativity, so when Halsey had its annual garage sale day, I asked Patti if I could set up at her place. Then I measured, bundled and priced hundreds of fabric pieces — knits, quilt fabrics, denim, velvet and much more. Much as I hated to let it go, I felt Mom would understand. As I handled the pieces my mother had purchased and enjoyed, I remembered her. Like many mothers and daughters, she and I had a complicated relationship. A private soul, there was so much she could never say out loud, communicating instead in hints that I seldom caught. In contrast, I always felt compelled to clarify everything in plain words for the world to hear, which she found horrifying. She was impatient with my dreamy impracticality and frustrated with my sketchy work ethic. As a child, I internalized her dismay into dark conclusions about my value and her love for me. Yet we always connected in our enjoyment of crafts, stories, humor in simple things and bargains. One of the best gifts she gave me, near the end of her life, was far more valuable than all the skills she taught and all the fabric she left. We had a conversation in which I was finally able to tell her about the hardest parts of my childhood and how abandoned and unloved I felt. By quietly listening, she gave me permission to say it out loud. Then, calmly and without defensiveness, she affirmed that she understood how it had affected me and went on to explain what had been going on in her life then, and in her marriage and the church community. She had loved me very much, she said. But she was completely overwhelmed with trying to survive. She was so very sorry I got the messages I did. As an adult and a mother of daughters, I could finally understand and heal. Parenting is far less a checklist of dos and don’ts than it is a glaring demonstration of who we are. We mother out of our tangled unresolved issues combined with a fierce love and a determination to get it right. Often, we are only beginning to figure out adulthood ourselves, and we desperately want to do our best with our babies. Meanwhile, we also struggle with finances, take care of elderly parents and work too hard. Our kids pick up unintended messages from the messiness of our lives. Yet I found, in the conversation with my mother, that when she let me revisit the past and explain how her actions had affected me, and then clarified without being defensive, it was as though in some mysterious way we went back and redid things, as they should have been done. So when an adult daughter asked to speak to me recently, I had a chance to put my philosophy into practice. We sat down with a pot of tea and I listened quietly, which is far harder than you’d think. I thought of Mom, doing this for me, and I didn’t burst into tears and insist on being reassured. Instead, I acknowledged what had happened to her and then carefully explained who I was at that point in my life, what was happening, what I was afraid of, why I did what I did, and how I would do it differently today. At the garage sale that sunny Saturday in Halsey, I watched with delight as women with my mother’s passion and determination marched in with large handmade shopping bags and gathered armfuls of fabric. My daughters walked all over town, sniffing out bargains, then came and watched my sale so I could eat lunch. They were as pleased as I was over the shy little girls who picked out pretty pieces from the scraps I was selling by the ounce and proudly paid the 30 or 50 cents by themselves. Mom would have loved it all. This complicated task of mothering is not something we will ever do perfectly, but I’ve found that enjoying the things we have in common, whether it’s tea or quilts or garage sales, will help us find our way through our relationship tangles. Most of our influence as moms will be unintentional, and we should work not so much on shaping our children as on becoming the person we want them to be. We can’t undo the past, but giving our children permission to talk about our mistakes and misdeeds is one of the best gifts we can give today, a way of reaching back and gently rearranging how things were to how they should have been.